Recently Google Accelerated Mobile Pages (AMP) officially went public with publishers such as The Guardian, BuzzFeed and Washington Post. 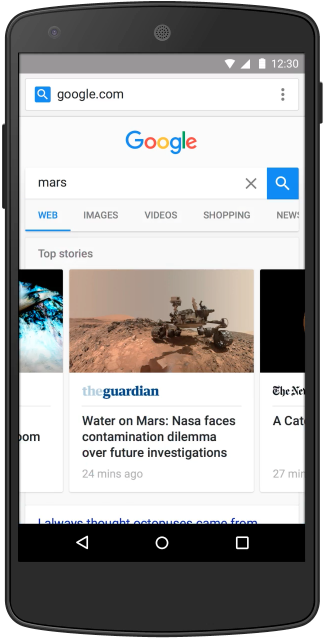 AMP is Google´s response to Facebook Instant Articles and Apple News with the purpose of delivering content at lightning speed on the open mobile web. The difference between Google AMP and Facebook IA/Apple News is that Google AMP is open source and available for everyone. Once you have content made according to the AMP specification, Google will find, index and present it as AMP content with a flash icon on articles and in search results. The content will do better in search rankings, not because AMP is a Google Standard, but because the fact that it will load faster and Google, as we know, reward speed. The technique is based on stripping off everything unnecessary, like cookies and scripts. Besides slimming down elements and calls, images will not load until displayed in the users view and the site loads faster since content is cached via the cloud and it does not have to be fetched at the publishers site at each request. Compared to traditional mobile sites, AMP-sites will load up to 85% faster according to Google. Fast loaded content will not, of course, be slowed down substantially by commercial content. So what has to be considered, is first of all, what you present on initial load, then after interaction, you can present more content in a number of ways. At Madington we have taken part of developers insights letting us prepare and adapt our mobile display solutions for the new environment. As soon as we have one of our fellow publisher´s website ready for AMP content, we will present a pilote-case within advertising. So stay tuned for an interesting glimpse of the mobile Internet of tomorrow. Madington´s developers are all certified in DoubleClick, Studio and HTML5 and are at the forefront of web advertising in general and mobile web advertising in particular. Don´t hesitate to contact us with issues regarding publishing or digital edge productions. This entry was posted by Madington. © 2017 Madington. All rights reserved.